This book was very thrilling. I enjoyed it. There should be an movie. It was cool. In my experience, Second Book Syndrome is a serious entity in the reading world. Sequels are rarely as good as what came before; I don’t know why, but it’s true. Feedback by Robison Wells is one of the few books in my experience that outdistanced its prequel. I was a bit tentative about starting this one, but Robison Wells really brought it all together for me here. One of my biggest complaints with the first book in this series, Variant, was how suspiciously similar to Veronica Roth’s Divergent it was. Both novels were released within a few weeks of each other, back in 2011, and it was just a weird reading experience for me. I did like Variant more than Divergent, but it’s not fun to be constantly reminded of another storyline while you’re reading. Thankfully, any hint of similarity to Veronica Roth was lost in Feedback, and it was wonderful to see the plot stand up on its own, away from dangerous comparisons. Feedback gave me the opportunity to really appreciate Benson Fisher as a character. Upon close examination, I’m pretty ecstatic by how well-rounded he is. Benson is selfish and single-minded. His biggest goal is self-preservation, and given the circumstances, I can’t say that I’d want him to be anything else. It’s a very realistic portrayal. Yet over time, he attempts to prove that he isn’t some self-important jerk, that he cares for people besides himself. From the beginning of the book to the end, I saw definite growth and development in Benson, and the Benson we know at the end of Feedback is really not the same person we were introduced to on the first page of Variant. That, for me, is always the most important part of a book for me, whether or not a character has learned anything over the course of a novel. Feedback really nailed that for me. In general, Robison Wells really outdid himself with characterization and realistic personalities in this book. Everyone is portrayed in shades of gray—there really is no human villain (but plenty of robot villains). Feedback is about a bunch of kids stuck in an impossible place, trying to make the best out of what’s happening, trying to live their lives as best they can. Fabulous characterization aside, I was also pleased with the dystopian elements in Feedback. Coming from someone who doesn’t like the dystopian genre all that well, that’s saying something. Other readers might have been disappointed by the non-answers and vague conclusions that this book reached, but I was satisfied. A few very small pieces of information were revealed, but I didn’t feel like Robison Wells was playing around with his readers, being coy on purpose. It’s just that Benson doesn’t know what’s going on, so neither do I. For me, it made sense. Wells’s prose is also very strong and well-defined, I found. Benson’s narrative is clear and makes sense. Yet, at the same time, I did have some trouble. It was like my eyes couldn’t stick to the page, so they’d wander around a bit, and I’d miss a couple of details here and there that, ultimately, were important for me to know. I’m not sure what caused that, though—could have been my fault. Altogether, I was totally impressed with Feedback. With this book, Robison Wells, has become one of my favorite dystopian authors, and probably one of my favorite YA authors all around. Coming from me, that’s saying something. 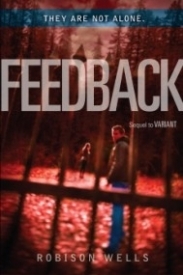 I totally loved Feedback, and I think it’s a wonderful contribution to the genre. Feedback was so disappointing compared to Variant. There was hardly anything to it. At the start, Benson had to find help for Becky, and when he did, he still happened to in reach of the compound, and he met the real people from which the androids were based on. I thought it would be that they escape and there is a whole uprising, but there is nothing of the sort. And for the rest of the book, they didn't leave, which was really stupid. They had so many chances to escape, but they never went, as Benson wanted to save the others, and Becky was injured. Now come on!! He could of gotten help from outside, and Becky had an arm injury, not a leg or foot one, she could walk perfectly!! I think it would of been better if they escaped, and gotten help. Feedback was also really dry, action and emotion wise. The only action was the occasional android spotting, and the 'fight' at the end. You'd expect to be a lot more fighting, especially for this book, but there was basically zero. And that great mystery surrounding Maxfield has withered and died, so the excitement drops even lower. For the emotions department, Benson did have some weird feelings for Becky, but nothing really happened, and they were bickering a lot of the time. Benson was emotionless, he wasn't scared, happy or even bored. He was just dull, and that was it. Nothing more and less, same with most of the characters. As the story wore on, I got more and more disinterested. There were long stretches of time when nothing happened at all. The characters kept getting muddled up. Who was Carrie? Who was Lily? Who was Harvard? I kept getting confused with the characters, as they all had the same dull personalities. This book had way to much characters. I was really disappointed with this book. There was nothing standing out, like the mystery of Maxfield in Variant, and even the people Benson found didn't really mean anything that much. I think that if you really enjoyed Variant, and want to find out what happens, read Feedback. Otherwise just give it a miss, it's really not that good. I'm not sure where to start, so I guess I'll just go straight for the strange. I can't really get into it since it's the big hook at the end, but seriously? What is up with that? I mean, I was down with the androids and ready for any other science fiction thing Wells would throw my way, but that was just strange. And since I'm assuming Feedback is the last of the series there's no explanation whatsoever. Okay, enough being all super secretive now. I'm sad to say that I'm rather disappointed by Feedback since I enjoyed Variant so much. Everything I loved about Variant just wasn't in Feedback, though. There were still some unanswered questions, but the mystery wasn't there. This time around it was basically just a lot of sitting around hoping for an escape route to become clear. There was some action here and there, but it didn't really draw me in and make me want to root for anyone more than halfheartedly. That's the other thing: the emotion wasn't there for me at all. Sure, I wanted them to get out of there, but the most passionate I felt was whenever a description of gore popped up and then it was just my insides wanting to make their way outside. Most of the characters were just background to the point that I could barely keep names straight. The Nutshell: I think the loss of the boarding school setting and the plot shrouded in mystery really did a number on Feedback. I wasn't swept up like I was in Variant and I couldn't really connect with any of the characters. If you loved Variant I suggest either skipping Feedback or lowering your expectations.